..and I think it's terrific. Do watch! ...in a Catholic primary school within reach of London, mark Feb 9th 2009 in your diary. There is a Day of Art and Music for such teachers - a visual presentation showing how the world's great religious art can be used to inspire children and teach the truths of the Christian faith, and a workshop on Gregorian Chant, finishing with a Mass at which the chant will be sung and newly-learned skills can be used....all this and a lovely lunch, and all in the attractive setting of Coloma Convent Girls School. For full details look here. ...here are some news snippets about Britain today. I have not made up any of these. - A town in Dorset where it has long been traditional for a local (17th century) militia to fire blanks from their muskets over the Christmas Tree has banned the practice on the grounds that the noise may frighten some children. - A town has not put up any Christmas lights because going up the necessary ladders etc to do would would constitute a "health and safety risk" for the workmen. - Young teenagers are to be given abortion pills in a pre-Christmas package, on the grounds that they will be sexually active at Christmas parties, and abortion drugs should be distributed well in advance. - Police at a seaside resort will be handing out contraceptives to people at local pubs and clubs over the Christmas season. Dear Lord, what has become of our country? ...are so much a part of life that it seems impossible to imagine a Britain without them. But start imagining now. A report in today's Daily Telegraph notes that some three dozen pubs in our country are closing every week. This is ghastly. The Telegraph quotes - and rightly - Hilaire Belloc: "When you have lost your inns, you may drown your empty selves, for you will have lost the heart of England." It's partly extra taxes on beer, partly the smoking ban, partly the cheap alcohol available at supermarkets. More information here. ...to mark the launch of a new book St Paul in Art, by Sister Wendy Beckett. Book launch parties are a bit like wedding receptions, lots of talking and people being introduced to one another, a great roar of chatter, then speeches and people trying to applaud while holding plates and glasses. ...I really love rain, so it was satisfying sploshing through gallons of it on my way to Mass this morning. Quite difficult to cycle, but I kept dry, thanks to J's excellent Army waterproof, much too large for me but a most useful garment once I had removed his rank-tag and also manouvered the hood into shape - huge because designed to cover a helmet. Beautiful singing at the 11.15 Mass at the Sacred Heart (Jesuit) Church in Wimbledon. A sermon about Christ's words concerning the Last Judgement :"I was hungry..."
A cheery lunch with friends in a local pub. Later a walk with J. in the evening lamplight. A late-night discussion with a friend about Govt plans to legalise forms of assisted suicide...have you notice that we are being softened up for this? Don't be fooled. Think about it. "I was sick you helped me to commit suicide..."
...but the talk yesterday by the deputy headmaster of the Cardinal Vaughan Memorial School in London was simply terrific. Amusing, forthright, forward-looking and with a positive outlook - and taking no prisoners in the battle against silly slogans. He rattled through a tally of them at one point - things like "social inclusion" and "personalised learning"... Promoters of a secularist agenda, he said "take a term with which no one will disagree and them rob it of all meaning". There is a campaign to marginalise the Church from Britain's educational system which at the moment is gathering all before it - "a never-ending centralisation masquerading as not being monolithic." But did I say he had a positive outlook? Yes, and he has -emphasising that it is up to us, as Catholics, to be clear about the reality of Catholic schools: they should be places where true learning, Christ-centred learning,thrives. We should not in any way try to downgrade the centrality of the Catholic Faith in Catholic schools but to explain and promote it with clarity and courage. Catholic schools can be there for the future, precisely because they are intrinsically able to respond to the needs of each new era and generation in a way that others cannot: "Only the unchanging enables us to change. The certainties of the Church enable us to steer a course as we tack through time and history." The meeting was organised by the Association of Catholics in Education. Worth clicking on that link and keeping in touch. ...is the name of a beautiful new DVD, launched last night with a party at Farm Street (Jesuit church). This is the beautifully-narrated, magnificently filmed story of some of England's churches. These are churches that are frequently ignored because they are Catholic. From the late 18th century onwards, Catholics were building churches and chapels - sometimes in fairly hidden places at first, but then gradually, as the law and public opinion allowed, more visibly in the streets of towns and cities. This new DVD tells about them - glorious ceilings and wonderful gothic arches, for schools and convents and parishes, Pugin and Bentley and more...it would make a wonderful Christmas present, and would also be useful for a parish to own, for showing to parish groups - old people's lunchtime gathering, Confirmation class, coffee-morning...you get good value for money as the DVD is in two halves, 120 minutes in all. Find out more here, and here, where you can order a copy..
an extremely interesting and informative read. You might, too. ... I thought I'd put this pic. on my Blog. 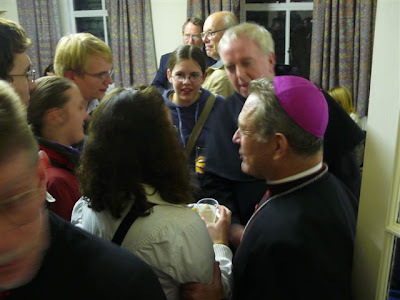 It's Catholic students at Bath, with the Nuncio at a reception following a special Mass at the start of the academic year. The pic was sent to me a few weeks ago, as I visited the Catholic chaplaincy at Bath - excellent chaplain Fr Bill - a while back. Young Catholics are a sign of hope for the Church and a reminder that the Faith is being passed on and the future holds bright promise. ...about Christmas, could I mention my books? Ideal stocking-filler for girls aged ten and up is We Didn't Mean to Start a School, paperback, fiction, just a happy read. Send a cheque for £6.95p (American readers - this means you, too. I can accept American cheques. $25.00 will cover book and air mail postage) and I'll rush you a copy. It's a traditional school-story, but set in modern times, and has had good reviews...Send cheque to me, Mrs J. Bogle, c/o Dept BLOG, OCU/Christian PO Box 44741 London SW1P 2XA. ...I swept up and stacked leaves in the garden, cycled to Mass, ate some brunch, cycled on to Mother's (good natter, plans for the week ahead), cycled on to the station, put the bike on the train, got to London, parked and padlocked bike near Westminster Cathedral, got Tube to Kings Cross and thence to Hatfield where I was guest speaker at the University of Hertfordshire Catholic Society. This was great fun, a good crowd, and a pleasure to spend the evening with them and with their splendid chaplain Fr Mark Vickers at St Peter's church, Hatfield This is a large church and has a particularly beautiful Crucifix in the sanctuary: a noble and arresting image to which everything else is somehow drawn. Evening Mass, and then people gathering in an adjoing hall for the talk. Later, after a good dinner and most enjoyable conversation, a train back to Town, and I collected my bike and set off for home via Waterloo. I hadn't allowed for the hassle of weekend engineering works: trains replaced by buses at Clapham Junction. How to get my bike on to a double-decker red London bus? The other passengers v. supportive -"Oh, go on, let her on - look, there's room." But the driver said it was against safety regulations and I was in despair, thinking I'd have to leave it (vulnerably, outside Clapham Jn railway station) and face a long walk at the final end of my journey. But the team of bus staff were kind- "We'll get you home, don't worry"- the next one along would be a coach, with a big luggage compartment, not to worry...and they stacked it safely in and I rode home in style. ...of an Advent/Christmas party for young impoverished mums and mums-to-be, mentioned on this Blog a few days ago, have asked me to thank the kind anonymous lady who responded to the appeal for gifts and has sent some really beautiful soaps and toiletries which will be hugely appreciated. 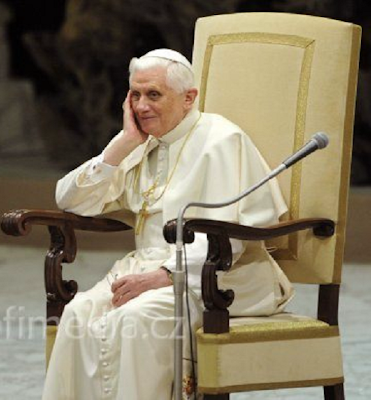 ...I put a picture of Papa Benedict on my Blog, just because I like him. ...a talk sponsored by the NW Catholic Writes' Guild, at Manchester University: Christianity in the aftermath of Roman Britain. November 25th at 7.15pm, at the Catholic Chaplaincy, next door to Holy Name Church. Information here. ...and to a meeting of the Cathsoc of UKC. For the uninitiated that means the students' Catholic Society at the University of Kent at Canterbury. This meets at St John Stone House (named after a courageous English Martyr - read up his story) under the genial guidance of the splendid Fr Peter Geldard. Mass first, a good-sized weekday congregation crammed into the tiny chapel. Then I was the speaker at the meeting ("Women and the Catholic Church") and we had supper and lots of talk. A great atmosphere, friendly, enthusiastic. They do all sorts of things - visits to shrines and places of interest, retreats, talks, but above all this is a group with a unity of prayer and purpose, where the Faith meets academic life and engages with it...I hugely enjoyed the evening. Huge TV screens enabled us to see the band and dignitaries gathering, servicemen in uniform, a choir.Then a clergyman's voice welcomed us, and voices sang "For those in peril..." Then a great spontaneous wave of applause as three frail elderly gentlemen, wearing medals, and with mufflers against the cold, bearing poppy wreaths on their laps, were brought foward in their wheelchairs by young people with great gentleness and care. The young people - in uniform, representing each of the three Services - were each in turn handed a wreath from elderly hands, laid it at the Cenotaph, stepped back, stood for a moment, and saluted. Then the chimes of Big Ben, and the silence. Winds rustled in the plane trees and a couple of golden-brown leaves drifted down. No one coughed, whispered, or even seemed to move. Lots wept. I wept. The Last Post. Reveille. "They shall grow not old...at the going down of the sun, and in the morning..." The Our Father. Then God Save the Queen, and it was over. The crowd, by now huge, remained silent as it dispersed. I don't think that I or anyone else present will ever forget it. 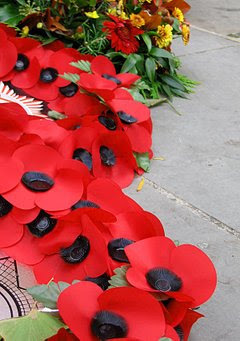 ...the poppy wreaths on local War Memorials glow against the grey of steady November rain, especially at twilight. At our local one in the High Street, there are wreaths commemorating a holder of the VC, with touching hand-written messages from children three generations on. Tomorrow, the last surviving Tommies from the trenches of the Great War will parade at the Cenotaph at 11 o'clock. ...have you signed the Live Chastely pomise yet? Why not? It's quite simple - you promise to live according to the Church's teachings and the natural law...it's for single people and married people, for everyone, regardless of age. We need 1,000 signatures and we need to hurry up and get them. American readers: this is for you too. ...and also donations of money, are needed for a Christmas party for young impoverished mothers. Can you help? What is needed is a small gift (value, say, about £2.50p), nicely wrapped - eg soap, sweets... Donations of money would be even more useful, as each mum also gets a big parcel of food and useful household and baby items...and in fact if you feel like posting something that could be added to such a parcel, that would be useful, too (packet of tea or coffee? a couple of nice tea-towels?). Send to: Good Counsel Network (Party Appeal), c/o 15 Maple Grove London NW9 8RD. ...is one of those topics that make for good jokes. There were some of these whizzing around at a gathering at St Anne's church, Banstead, earlier this week where I was among those talking to families of First Communion children. It was a wonderful, friendly evening - the parish has a super priest and a great atmosphere. It was possible to explore issues of real depth, with a focus on prayer and a sense of tackling things that really matter. The parish is using this excellent book for First Confession and First Communion preparation. ...to schools have been a major feature of life this week. Yesterday I went to give a talk about journalism to a Catholic girls' school in Upminster - this is part of a programme of talks given as part of the Tamezin project. I hope girls from the school - who were all attentive, friendly, and looked v. nice in their blue uniforms - will take part in the Tamezin Young Writers Award. ...I went to Newman House, the central Catholic Chaplaincy for London University. An absolutely packed Sunday Mass, excellent singing, a glorious Litany of the Saints, Latin, incense, wonderful atmosphere with so many young people. Only problem was that it was uncomfortably hot - the chapel is too small for current numbers, and having been built into the back of the (??Georgian?) house in Gower Street it has no proper windows except some skylight ones into the roof. It was a glorious Mass, with a baptism of a baby, born to a young married couple who had met at the Chaplaincy...the baby yelled magnificently at the exorcism prayers, which is just what is meant to happen, and then was absolutely happy and gurgling after the baptism, all enchanting in white gown and downy head...afterwards a student lunch (excellent fish-and-chips) and I was guest speaker, on "Celebrating traditional feasts and seasons" and it was all enormous fun. ...the evangelist, author, and lecturer, spoke to a packed church at Farm Street on Friday night. This was the Annual Lecture sponsored by the Catholic Truth Society and it was sold out. Deservedly so. It was an absolutely terrific lecture, immensely interesting. Taking as his theme the New Testament's description of the encounter on the road to Emmaus, he spoke about how the disciples had experienced their "hearts burning within them" when the stranger they encountered on the road explained the Scriptures to them, and then how they finally recognised Him "in the breaking of bread". Hahn showed how this is also the pattern of the Mass: the preparation in the Scriptures and then the reality of Christ in "breaking of bread". 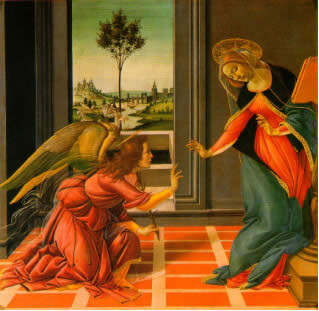 He set this in the background of his own journey to the Catholic Church beginning with a teenage involvement in a Bible study group, and then the massive influence of discovering the Church Fathers and the way they opened up the Scriptures for him...then the discovery of the Mass and the way it brings the Scriptures alive. It was both inspiring and intellectually stimulating, and during his talk you could have heard a pin drop, the listening was so intense.